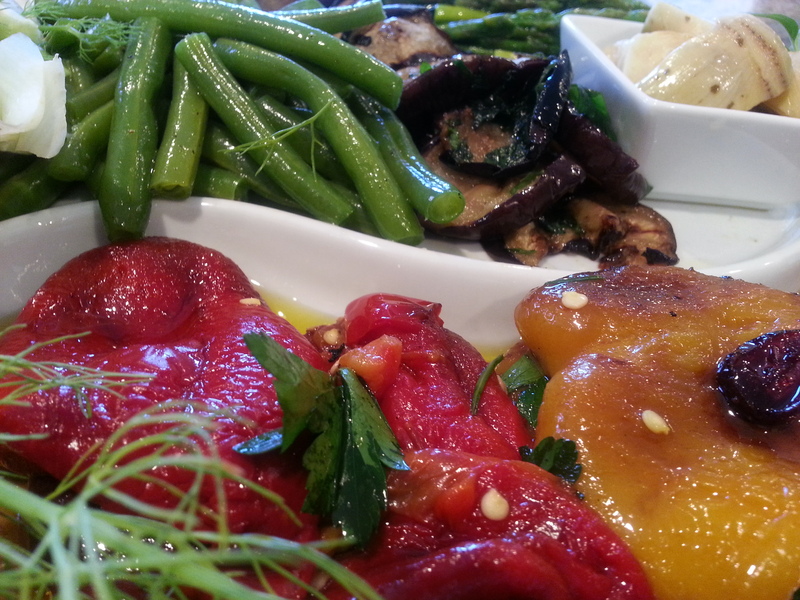 Choose a variety of veggies and grill to your liking, then enhance their flavors. Roasted Red Peppers peeled by placing them in a covered dish for 10 minutes, remove the skin and discard. There sweetness is tasted through a unique marinde for 2 hours by adding: minced garlic, parsley, raisins, capers Extra Virgin Olive Oil. Green Beans hardiness are enjoyed by gently boiling them for 6 minutes, drain, place into a bowl and toss with: salt, pepper, chopped thyme and wet with Extra Virgin Olive Oil. Grilled Portabella Mushrooms are delectable with Boursin Cheese, a quarter minced cl0ve garlic and chopped rosemary. Steam Fennel for 3 minutes and add to grill. Enjoy when cooled! Artichokes are made tasty with added lemon zest Extra Virgin Olive Oil. 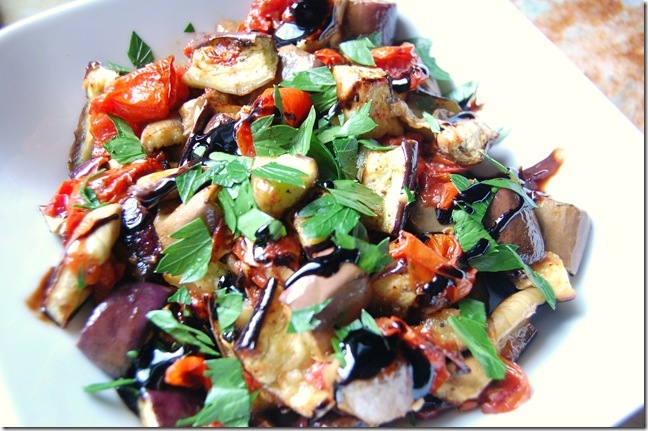 Thinly slice Eggplant and lighltly salt, placing into a colander for 20 minutes. Dab dry with a paper towel and place the slices onto the grill. Once done toss slices in a medium size dish with: oregano, minced garlic clove, red pepper flakes, parsley, and add Extra Virgin Olive Oil. Peel eggplant, cut into cubes, lightly salt the cubed eggplant, place into colander and place colander onto a bowl to collect the water from the eggplant for 30 minutes. With a paper towel dab dry the eggplant. In a skillet over medium heat brown eggplant as the water from the vegetable releases its vapor. Add olive oil and minced garlic and cubed eggplant. Stir the egg plant in the skillet for 10 minutes. Remove from heat. Place eggplant into a bowl, add parsley/clinatro fenugreek, red pepper flakes and combine all ingredients with a wooden spoon. May be served at room temperature. 1. Fenugreek is known to reduce risk of heart strokes. 2. Oestrogen like properties to help reduce menstrual cramps and discomfort during menopausal symptoms. 3. Reduce labour pain and helps against iron deficiency post pregnancy. Increases milk production in lactating mothers. 4. Galactomannan is a natural soluble fiber that makes fenugreek beneficial for people with diabetes. Fenugreek is best known for the benefits obtained from its external use. The paste can help get rid or skin irritation, wounds, muscular pains, scars, etc. It is also used as a beauty product in face packs to remove pimples and blackheads. If consumed like green tea with honey and lemon, fenugreek can help reduce fever. Easy Preparation time 5 minutes. Chill time 1 hour. Place chocolate chips egg and flavoring in blender and chop. Heat cream until very hot and small bubbles appear at edge. Do not boil. With blender running, pour in hot cream. Blend until chocolate is melted and mixture is smooth. Add sugar and Whipped Cream, blend for another minute. In dessert dishes, place 1 Tablespoon of Whipped Cream and 5 Raspberries. Pour into dessert dishes, cover with plastic wrap, and chill until firm. Top off with whipped cream, 5 raspberries and shaved chocolate garnish, if desired, or sprinkle the whipped cream with a little cocoa. Risotto is Italian comfort food which can be served simply by itself, or add in a choice of vegetables, seafood, or meat. In a skillet over medium heat add sausage and break it into small pieces with a wooden spoon. Once brown it is down. Place a colander into the sink and place cooked sausage into colander, allowing to drain for 10 minutes. Heat 2 T of olive oil or butter in a well-seasoned, cast iron skillet (or the heaviest, non-stick skillet you have.) Add 1 pat of butter and chopped shallots or onions to the oil and sauté for 2-3 minutes over medium heat. Add your Arborio rice. For this example, we’ll use 1 cup. This is enough to feed four to six as either a first course (the Italian tradition), or as a main course. Stir the rice well with the onions, butter and oil, because the purpose is to thoroughly “coat” the rice. This helps regulate absorption of the liquid. Add 1/2 cup of dry flavorful white wine. When the wine is about 3/4’s absorbed, reduce the heat to the lowest setting if you are cooking in an iron skillet, (low medium if in anything else), and ladle in enough stock to cover the smoothed out risotto. When the added liquid level drops about 1/3, re-cover the risotto with more stock. (Continue this process for about 20 minutes.) At about 10 minutes of stirring rice add your mushrooms and sausage. The end of the cooking is critical for the final texture of the dish, so when the rice is mostly tender, but with just a hint of texture to it, and the liquid you have added to this point is mostly absorbed, add the Parmesean and 2 T of butter. At this point, stir the risotto to blend in the cheese and remove your finished risotto from the heat. Select seafood of choice: mussels, shrimp, clams, calamari, or octopus. Place seafood into a bowl with garlic clove, salt, red pepper flakes, white wine. Set aside. Heat 2 T of olive oil and butter in a well-seasoned, cast iron skillet (or the heaviest, non-stick skillet you have.) Add 1 pat of butter and chopped shallots or onions to the oil and sauté for 2-3 minutes over medium heat. Add your Arborio rice. For this example, we’ll use 1 cup. This is enough to feed four to six as either a first course (the Italian tradition), or as a main course. Stir the rice well with the onions, butter and oil, because the purpose is to thoroughly “coat” the rice. This helps regulate absorption of the liquid. Add 1/2 cup of dry flavorful white wine. When the wine is about 3/4’s absorbed, reduce the heat to the lowest setting if you are cooking in an iron skillet, (low medium if in anything else), and ladle in enough stock to cover the smoothed out risotto. When the added liquid level drops about 1/3, re-cover the risotto with more stock. (Continue this process for about 20 minutes.) At about 15 minutes of stirring rice add your add all ingredients from seafood bowl into risotto. The end of the cooking is critical for the final texture of the dish, so when the rice is mostly tender, but with just a hint of texture to it, and the liquid you have added to this point is mostly absorbed, add the Parmesan. At this point, stir the risotto to blend in the cheese and remove your finished risotto from the heat. Lower incidents of cancer and “arrest progression” of Breast, Colon, and Prostate, as well as a slowed “Aging” process across all micro organisms, are being attributed to nutrients consumed from the Mediterranean Diet. Organs effected by Alzheimer, Cardiovascular, Diabetes, Hypertension, and Parkinson Disease once thought to be pre-dispositioned diseases, are now completely avoided due to the higher intake of a plant based-fish/poultry diet that includes a lifestyle change with exercise. In order to understand nutrition related disease we first have to address nutritional intake for the Standard American Diet (S.A.D.) and understand what nutrients are common within the Mediterranean Diet that promote well-being. 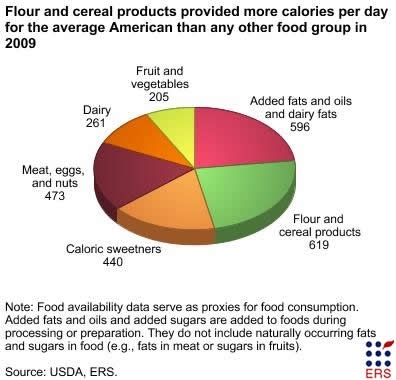 Caloric Sweeteners, Flour, and Cereal Products make up 41% of the S.A. D., Fruits and Vegetables are only 7% of the S.A.D. Two critical points that Doctors raise as red flags. 1. Higher amounts of calories are in the Standard American Diet. 2 Empty calories that promote aging is due to how the body is required to process calories that the body cannot use and have small to no amount of vitamins, minerals, or antioxidants available. In contrasting the diets, note that 41% of the Standard American Diet is dedicated to the consumption of chemical sweeteners, refined flour, and cereal products. The Mediterranean Diet has no chemical sweeteners and only 17% of the dietary intake is in pasta and breads. Fats, Oil and Dairy products are almost an even draw in calories. S.A.D 596 calories or 23% of dietary intake vs Mediterranean Diet 617 or 35% of dietary intake. S.A.D. utilizes fats such as Margarine, Canola Oil, Butter, and processed cheese. Mediterranean Diet utilizes Olive Oil (3 Tbsp/day), daily fresh made or aged cheese. So far the Standard American Diet in just two arguments has shown that 1,655 calories, or 64% of an average American’s diet is composed of sweeteners, refined flour, and processed saturated animal fat. The Mediterranean Diet demonstrates that 917 calories, or 52% of it’s nutritional intake comes from grains, refined flour, plant based oil, and freshly made or aged saturated animal fat. S.A.D. Protein intake is 473 calories or 18% vs. Mediterranean Diet 235 calories or 13% of total intake. S.A.D. is heavily loaded with red meat some chicken / pork and low amounts of fish. It is important to note that red meat has 92 calories per ounce. Mediterranean Diet loads up on fish, poultry and some pork with red meat entering their dietary intake only once every 7-10 days. White meats and fish range from 32-37 calories per ounce are easy to digest and the amount of available oils high in omega 3 promotes healthy organs. Protein intake is a critical part of everyone’s diet. Vitamins B12 & B16 are most prominent in meats and provide nutrition for the central nervous system. However, balance is most important when consuming protein. Omega 3 and Protein are in all the meats, fish, and poultry, however the omega-3 is in higher amounts within certain fish (Anchovies, Sardines, Herring, Mackerel, Salmon) also easier to digest. Red meat can take 48-72 hours to digest, therefore a contributor to the aging process of the body as organs endure a work out to utilize and expel what is not needed. In many cases saturated fat is then deposited into the arteries and begin to engulf the organs. Those who follow the Mediterranean Diet are more likely to consume 400 calories or 22% of fruits and vegetables through out the day. Consuming wholesome nutrients found within natural wrappers provides the human body systems with vitamins and minerals that it needs to function daily. Free Radicals expedite the aging process by harming the cell membrane. Anti-oxidants neutralize the free radicals, and therefore protect all cell membranes. Eat a variety of colorful fruits, vegetables, herbs, and spices to keep your body loaded up on anti-oxidants. Basil / Bay Leaves: Antibacterial, antiviral, and antioxidant properties. New evidence suggests basil can decrease carcinogenesis, and help protect against the proliferation of cervical cancer (HeLa cells). Cinnamon / Cloves: Increased levels of iron and calcium are components that may be attributes of the anti carcinogenic, pro-apoptotic, anti-proliferative properties. Cervical Cancer, Colon Cancer. Ginger: Has shown that it inhibits cancer cell growth in prostate cancer patients. Sumac: Has both anti-oxidants and anti-microbial properties, preventing the on set of cancer. Add resveratrol to your meals, finding it within a variety of sources: purple grapes, cranberries, blueberries, peanuts, pomegranate and Italian Red Wine. Making small dietary changes will promote overall health and reduce incidence of nutrition related disease and cancers, therefore leading to days of improved strength, stamina, and endurance. Resveratrol reduced esophogeal tumors in rats. Li ZG, Hong T, Shimada Y, Komoto I, Kawabe A, Ding Y, Kaganoi J, Hashimoto Y, Imamura M (September 2002). “Suppression of N-nitrosomethylbenzylamine (NMBA)-induced esophageal tumorigenesis in F344 rats by resveratrol”.Carcinogenesis 23 (9): 1531–6. doi:10.1093/carcin/23.9.1531. Intestinal and Colon Tumors. Athar M, Back JH, Tang X, Kim KH, Kopelovich L, Bickers DR, Kim AL (November 2007). “Resveratrol: a review of preclinical studies for human cancer prevention”. Toxicol. Appl. Pharmacol. 224 (3): 274–83.doi:10.1016/j.taap.2006.12.025. PMC 2083123. PMID 17306316.